Healthcare in the US is becoming increasingly digitized. Mobile health or mHealth is a rapidly expanding area, where cell phone apps and wireless devices with sensors collect a person’s health data. Hospitals are moving away from paper records. At UNC for example, your electronic records can be accessed by the doctor treating you, or by yourself if you log onto myChart. It’s now possible for doctors to issue electronic prescriptions, and it might not just be possible, but mandatory. As of March, New York is the first state to not only ban paper prescriptions, but penalize any doctors that use them. So where is this all heading? What is a possible future for our healthcare in the context of technology? Naya: To answer this question, we looked overseas to a small Baltic country that is so tech savvy, it has been nicknamed “The Digital Society”, Estonia. To do this, we had the help of Elle Law who is half Estonian and holds dual citizenship in the US and Estonia. Law is also a UNC alum and her main interest is public health in the context of globalization and systems. She reached out to us about producing this episode while in Estonia this fall. 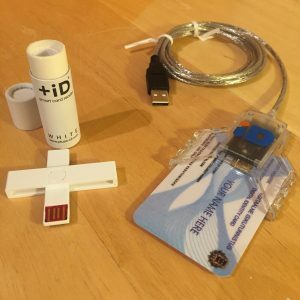 Smart card readers can be purchased in many stores, and plug into the USB port of a computer. A typical smart card reader (right) can be purchased for less than 10€. More compact card readers have also been designed (left). Elle: Welcome to Estonia. The same country that created Skype [insert Skype boot up noise] is also the only country in the world with nation-wide online voting. Through its online State Portal, it provides to its citizens more than 3,000 government e-services, that happen electronically from start to finish. This e-Government includes filing taxes, digital signatures, filing complaints, …even fishing licenses. To find out more, I attended a presentation at the e-Estonia Showroom, which shares Estonia’s digital story with visiting delegations. Indrek: If I want to communicate with my government I can do it at 4AM on a Saturday morning in the middle of the forest on a mobile phone. 99% of state services are online. If you want to go fishing at 4AM, you can pay online and by 4:02AM you have your fishing license. Elle: That was Indrek Õnnik, a project manager at the showroom. He goes on to say it’s easier to explain what Estonians can’t do on the internet. There are 3 things Estonians cannot do on the internet. Get married. Get divorced. And buy or sell property. This is only because the government wants to be sure you actually want to do it. Jessica: So what does health care in Estonia look like? Elle: Vitaliy Lakusta is originally from Ukraine, but has been working in Estonia as a software engineer for the past two years. This was his first encounter with the Estonian health care system. Vitaliy: So it was last winter. I have a friend who was 75 years old, his name is Lembit. He was sitting there on the bench and he said “Vitaly, I need your help”. He had just slipped over the ice. First I was perplexed at what had happened. I kinda tapped him on the shoulder. And he said “Ouch ouch! Don’t don’t tap on it” So he, I don’t know, fractured his shoulder. He didn’t know.., it was just pain. So he said, yeah could you help me get home. I said, “No you’re not getting home, you’re getting to the hospital”. So what happened is like, very easy. You just come in and we were just told to wait. Then the doctor just took his ID card, and then he said I made a prescription of the things you have to get over the next two weeks, and then I was confused because he didn’t give him any paper, nothing was signed. So he said, “yeah the prescription is done, now just go to the pharmacy and buy stuff”. Elle: I asked another person about these ePrescriptions. This is Anna Liisa Regensperger. She works as a museum manager, but her mother is a doctor, so she knows a bit more about the system than the average Estonian. Elle: ePrescriptions were first available to Estonians in 2010, and today over 95% of all prescriptions are paperless. The ID card that Anna Liisa mentioned is not just a card with a picture of your face. It also verifies a person’s identity in the digital environment. Just like with chip enabled credit cards, the ID card has a special chip, and can be inserted into a card reader. You can also lock a lost card, just as you would with a credit card. What makes the ID card very different from a credit card is that it has two PIN codes. One is used to verify your electronic identity and the other for your legal signature. So even if someone picks your ID card up in the street, they can’t do anything with it, because they don’t know your PIN codes. 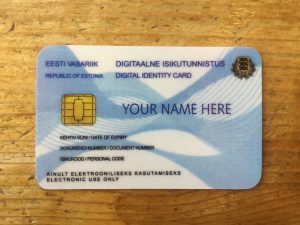 Naya: This mandatory ID card was introduced in 2002, and is an essential component to what makes the Estonian eHealth system work. Printed on the ID card is a number that allows each person to be uniquely identified. This number is linked to basic information such as name, birth date, and address, which is all stored in a database called the Population Register. Elle: Using your ID card, you can log into your patient portal, called “minu eTervis”, or my eHealth. Anna Liisa: Every time you go to the doctor they sit behind the computer and write something down. So the idea is that in the end it will also appear on the homepage. And when you log in only you can see and nobody else. So maybe if you forget what the doctor said how you have to take your pill or forgot what’s wrong with you or what’s not, you can read it again. Elle: On the other end of the stethoscope, doctors view patient information through the Electronic Health Record. This is a powerful tool that lets them access a patient’s entire medical history in one file, no matter when or by who that person was treated. Test results are also available as soon as they are entered, including images such as X-rays. Maie Knöble who has experienced both the Estonian and the American healthcare system. 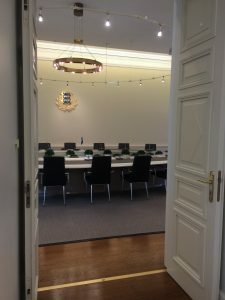 eGovernance is present in the Government Session Hall in Stenbock House, which is the official seat of the Estonian government. On the ceiling, the corner of a digital projector is just visible. This is one of four projectors that together display digital documents on all four walls of the room. Meetings are paperless, and government officials also view documents on laptops or mobile phones. Maie: Administration in the health system in Estonia is pretty much IT based usage system where you go with your ID card. So no filling forms, no filling papers as you go to any doctor, or also as you check in a hospital, or anywhere. You just use a card and you identify. So you have your regular doctor, your general practitioner, and you go to the specialist and he/she can see your diagnosis, prescriptions, everything is in the system. So you save time for yourself and the doctor going over of all of those questions as you usually do when you see a new doctor. That’s a huge advantage yeah. I mean, if you think about how little time the doctors have for patients, and how busy they are, that saves them a huge pain. Elle: During a medical emergency, you don’t even need to be conscious, as a paramedic or doctor can use your ID card to find out your blood type, allergies, or pre-existing conditions to make life saving decisions. Jessica: On the scale of public health, the system also automatically compiles data for national statistics, measures health trends, and tracks epidemics. In this way, it acts as a feedback loop on how health resources are being spent. Naya: So how did the Estonian government make all these information services work? One big heavily guarded server with everyone’s data stored on it, right? Elle: The real answer might surprise you. The key is decentralization. Jessica: Though it may sound like a centralized, national database, the Electronic Health Record actually requests data from various health providers in Estonia. Even if those providers are running different systems, it doesn’t matter, because the data is standardized. As a result, when a doctor pulls up your file, he sees your complete medical history in one file: previous test results from a clinic, prescriptions, notes made by a doctor in another hospital, and so on. This is the way all e-services in Estonia are provided, drawing information from a network of separate databases, in different physical locations, run by separate institutions. Naya: How is all this data retrieved? Elle: Using something called the “X-road”. X-road is a secure gateway service architecture, a system that allows for data exchange between different systems without using a main hub. In simpler language, when a system wants X-road to send data to another system, X-road says: Tell me who you are and what you want. Once the system verifies its identify, a point-to-point connection is made. Once the two systems have exchanged information, there’s no point in being connected anymore, and the connection is terminated. Jessica: This all happens on public internet, not a government internet network where you need special access. You can access it through your wifi at home, on the go using your phone, or at a library. Elle: And so it’s not just government institutions using X-road. The private sector uses X-road too, like banks, telecom companies, stores, and private hospitals. The wallets of Estonians are slimmer in a good way, because the ID card acts as a driver’s license, a passport within the EU, and as a library card or a customer loyalty card. Naya: The decentralization of databases and servers is also advantageous in terms of security. Because everything is separate, nobody has the whole picture. If one of the security servers on any database of an information system detects that there is something in between, someone else that wants to get part of this information, then it terminates the connection instantly. Indrek explained it further in the eShowroom. Indrek: We have a distributed network. So if something happens to one part of it, then you can cut it from the whole system, the system is still healthy, which guarantees we can still deal with the issues of one specific thing. So regular usual hacking measures don’t apply to our system. Elle: Estonia also uses something called keyless signature infrastructure, or blockchain technology. Indrek: We link data together each second and we add the time stamp each second. Which means if somebody starts manipulating the data in our systems, we would actually know about it the next second. You start hacking right now, then we will know about it right now. It doesn’t matter whether you’re an external hacker or an internal privileged administrator of the service. It doesn’t matter. If you’re doing something you’re not supposed to, we will know about it. Jessica: What about privacy issues? The Estonians have an answer to that too. Anytime anyone looks at your information, whether a police officer, a tax official, or a pharmacist, it’s automatically logged for you to see. [Insert keyboard click sound] Systems are regularly independently audited to ensure it remains that way. Elle: Even though Estonians have put their information into these databases, in a sense, they have more control. In the US, you don’t know if the policeman driving behind you looks up your license registration, or if a insurance company reviews your medical information. In Estonia, as the owner of your data, you can see who is looking at it and when. And if a snooper has no legal basis or reason to be looking at your information, it doesn’t matter who they are. Estonia has strict laws. You can submit a complaint, and they can be fined, lose their license, their job, or even go to jail. Jessica: Now that we have an overview of Estonian healthcare and how it works in the context of Estonia’s e-Services, here’s a question you may have been thinking. Naya: How does a country create such a digital society? Elle: To understand this, we’re going back in time to understand the Estonian mentality when it comes to planning ahead. Jessica: Estonia has rarely been a free country. Estonians have experienced waves of invasion and foreign rulers. The most recent occupation began in 1944 by the Soviet Union during World War 2. For the next several decades under Soviet rule, Estonian health care was directed by central planning from the Soviet government. Elle: I spoke to Vello Ilmoja to gain a sense of what healthcare was like during the Soviet occupation. He graduated as a doctor from Tartu University in 1954, and served as head doctor in two hospitals. Vello: The organizers for medical care from the Soviet side would often interfere and it was pointless. They didn’t understand the local solution so they would have directives that were locally inappropriate. So often we were looking for different ways or paths to get our own things done better than directed. Elle: In a top down system where directives could change and often weren’t compatible with local needs, a dual reality began to emerge. There were the directives that came from Moscow, and the work arounds Estonians developed to try to keep things moving. Naya: So it’s unsurprising that before Estonia actually regained its independence, Estonians were already quietly preparing their future government months or years ahead. Vello, who later became the first Minister of Health, joined a group of doctors who went to Canada to see their health care system in hospitals. Vello: In the fall of 1990, in November, we were with a delegation in Canada. There was a reception, where I was asked to speak, and at that time I remember I was asked, “When do you expect to become independent?” And I responded, “we hope we will become independent within two years”. But it turned out it came even faster, it was a year later in 1991, when independence happily occurred. Elle: They didn’t know if or when independence would actually be achieved, but they were going out on a limb and planning ahead anyway. I asked Vello weren’t they worried about the risks of being noticed by the Soviets? Listen to his tone as he responds. Vello: Without brave determination, you get nothing done. Elle: A rough translation is “Without brave determination, you get nothing done”, which reflects the planning mindset of the late 80s. Elle: In 1987, the Isemajandav Eesti program was proposed by the Estonians. Also called the IME program, it was officially a request to govern themselves economically. It was also an unofficial maneuver towards political independence. Vello was part of the team that put the policy on healthcare together. Vello: Of course we had to estimate the risks. In order to get the IME program through, they had to be crafty and coach it in language such as “raising production quotas” [the Soviet Union was all about quotas]. We had to be creative and clever too. [16:08] We supported the IME program through forming this association with our own point of view and preferences and demands on how to organize healthcare. A delegation of doctors went to Moscow and said we should be independent and manage ourselves. Jessica: Their delegation was screamed down. It was as bold as the state of North Carolina telling Congress, “From now on we would like to stop following national health care policies and standards.” By seeking independent economic oversight of the medical system, they were calling into question the Soviet system of government. The Central Party of the Communist Party vehemently rejected the IME program. Maie: People were not so scared anymore. Everybody was ready to work towards doing some of whatever they could do. So people took decisions. But of course it was bold decisions. [Need time stamp] Some people definitely were jailed, even in 88 and 89. We started about a year before, I guess 1990, we were all already repairing certain things for certain legislation for independence. We were working on our own tax code. People would volunteer to do that. As for Russians, we wouldn’t tell them we were doing that. So when the foreign experts pulled in after independence, a couple of months, they couldn’t believe it. They said “Ok now we gonna tell you what is valuated tax, we going to explain to you, and then you know after we go through this, and we give you some samples, maybe you can put together a draft. “Then can you imagine their faces when I’m just pulling out from my drawer, “Here is a draft!” I had done 6 months ago this draft. They couldn’t believe it. They almost were losing consciousness! Naya: Why was everybody so ready to take responsibility? Elle: I asked Kermo Pajula, who works as a developer in Estonia. Kermo: I think it’s because the Soviet union had set so many boundaries and limits to Estonians. And once Estonia gained its independence, everything was possible all of a sudden. I think and some of my friends think, that Estonians felt the need to prove themselves. That they are better on their own then they were as a member of the Soviet Union. Elle: When independence was achieved in 1991, there were limited resources. The newly fledged Estonian government realized: We won’t be able to set up branches throughout the country. But we want to be democratic and provide services for everybody, not just the third of the population that lives in the capital. How will we achieve this? This was a big question throughout the 90s. Maie: We had this collapse of the Soviet Union, and the new country, and the new building up everything. We’ve gotten through lot of changes, a lot of change management. You have politically and economically such big changes as we had in the early 90s, everyone had to do a change management, even if they didn’t want to, they had to. And I think that helps. That just got them experienced of this change management. I think this makes things easier for you in adapting new technology, new things. Jessica: After having to conduct so much change management, Estonians wanted a system that could adapt to the future needs of a growing country. Something to streamline the government. Something that could take advantage of new technologies. Elle: The solution appeared five years after independence, in the form of a proposal called Tiigrihupe, or Tiger’s Leap. This government project heavily invested in building network and computer infrastructure. Most importantly, it taught the people how to use computers, bringing internet to all schools and information tents at public events. Indrek: Year 2000 was the first eSolution available. However teaching the people, we started in 1996. So 4 years before we even had any services available we started familiarizing computers to people. You might have heard of the program called “Tiger Leap” where we digitalized the schools as well, computer classes. We set up huge tents, put computers in those tents, and then invited people in to use the internet, to access Microsoft Paint. Very simple things just to get people acquainted with computers. Today this is not sensational, but two decades ago this was something else. Elle: In other words, Estonian leaders saw emphasizing technology to the people and in the government as a way to future-proof the systems servicing the country. To put into context how forward thinking this was, at the time Tiger’s Leap was proposed, email did not even exist. Naya: Let’s get back to the present. Estonia now wants to help other countries develop similar systems. Last year Finland adapted their own equivalent. Indrek: We call it “X-road”, the Finish call it “kappa” but it’s the same solution, and this is sensational in the sense that it’s the Estonian and the Finnish government are using the same platform. This means we can exchange data if needed. In a year or two, I’m going to be able to pick up my prescription medicine in any pharmacy in Finland as well and Finnish people are going to be able to pick up their prescription medicine in any pharmacy in Estonia as well. So this is what we’re moving towards. Elle: These data sharing systems in health care are not just limited to Europe. They’re appearing in the US too. Maie: When I was in Johns Hopkins this spring, in the US to some extent there are such systems. So in Johns Hopkins when my data was entered of course I had to fill in the forms, so it wasn’t digitalized in this sense, you don’t put the card in or so. Once you fill your medical history in, then it’s in the Johns Hopkins system. So if you use another Johns Hopkins doctor, it basically works as the same as in Estonia. Or if I went at Johns Hopkins to do an MRI and the doctor is sending me to do a test, they already could pull up my data in the system and see who I am and the personal data and also whatever was entered. So kind of things are existing there also, they are just very local systems. Jessica: These localized systems, and there are many, are all attempting to capture data that is missing from another system, and without the standardization seen in Estonia, allows certain problems to persist. For example, when you fill a prescription for a controlled drug, it gets added to the controlled substance database of the state it is dispensed in. A doctor or pharmacist can check that database to ensure a person is not getting a prescription from multiple doctors. But because states manage their own database, a doctor in Tennessee may not see the prescription filled in North Carolina. To address this, PMP InterConnect was developed in 2011, a secure exchange platform to link state databases. 37 states are now using PMP InterConnect, but North Carolina is among other states that are not yet on that list. Elle: Similarly, localized systems provided by different vendors means certain beneficial software may not be available to everyone. This is especially important when you consider built in checks and balances for when a doctor makes a mistake, as Maie discovered in Estonia. Maie: The IT system is built up that way that it doesn’t allow or eliminates, so the doctor cannot even prescribe you any medication that is in conflict with anything else that you’ve been prescribed by somebody else. I didn’t know that until a couple years ago when I was picking up medication for my mom. Doctor has overlooked something, which in any system happens. “Well yeah she’s put it in the system, but we can’t fill it because the system rejects it” “That’s strange why would the system reject it?” Well because it conflicts with the other medication she has. The system itself blocks it. So the doctor has to go back and check and possibly prescribe something else. Which I think is good. Naya: Some argue that adopting similar systems in much larger country such as the US is impossible. Although X-road is scalable, security on a larger network would be much more difficult to guarantee. Americans also trust the government with their information less than Estonians. Jessica: But change is clear. Elle: We’re currently in a movement where we as patients are encouraged and expected to take control of our own health data. To feel ownership of our health, we need to have access to our own records. Our government, doctors, and public health researchers are looking for ways to increase patient participation, access to data, self-monitoring and health education. And we’re turning towards IT based solutions, especially those that give freedom to the movement of health information. The following is a direct quote from the website of HealthIT.gov. Jessica: The Health Information Technology for Economic and Clinical Health (HITECH) Act, represents the Nation’s first substantial commitment of Federal resources to support the widespread adoption of Electronic Health Records (EHRs). Our world has been radically transformed by digital technology – smart phones, tablets, and web-enabled devices have transformed our daily lives and the way we communicate. Medicine is an information-rich enterprise. A greater and more seamless flow of information within a digital health care infrastructure, created by electronic health records, encompasses and leverages digital progress and can transform the way care is delivered and compensated. With EHRs, information is available whenever and wherever it is needed. Elle: The HITECH Act was signed into law back in 2009. What will America’s version of a digital society in healthcare look like? We’re staying tuned. Naya: This episode was written and produced by Elle Law, with support provided by (me) Naya Villarreal, Jessica Southwell and Branson Moore. 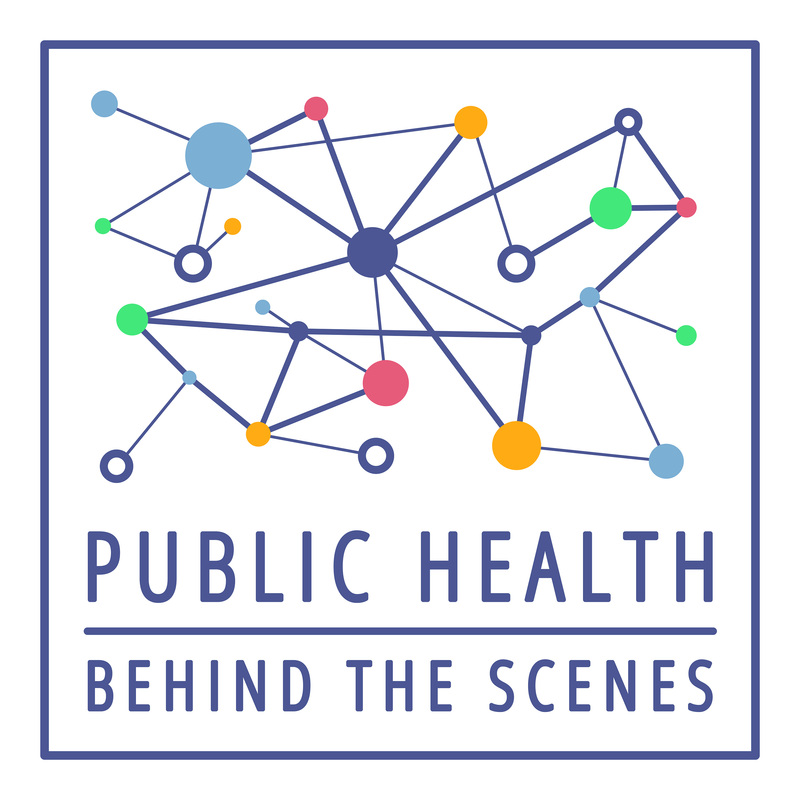 Jessica: Do you have an interesting story or public health perspective to share? If so, pitch us your idea at publichealthpodcast.com or on Facebook at Public Health Behind the Scenes. Elle: Many thanks to those who shared their time, experiences and thoughts with me: Indrek Õnnik, Vitaliy Lakusta, Anna Liisa Regensperger, Maie Knöble, Vello Ilmoja, Kermo Pajula, Merle Puusepp, Jaana Karsanov, and Brian Antono. Special thanks to Keiu-Kärt Land-Boyd and Elo Valdsaar for checking translations, Corey Davis and to Naya and Jessica for letting me create this episode. Last but not least, a group hug to you for listening.